As a leading provider of RF over Fiber & Optical Delay Line solutions, we will be attend two exhibitions: ECOC 2018 that will be held at the Fiera Roma in Italy, and EuMW 2018 that will take place at the Ifema Feria de Madrid in Spain. At the events, our RFoF and ODL solutions (which are used by Tier 1 and other enterprises active in the broadcast, audio and video sector as well as in the telecom, aerospace, governmental, and research labs industries) will be showcased. Our RF over Fiber modules (RFoF) are suitable for any application where cables are not sufficient, especially when high performance is required. Our RFoF products are programmable and offer the best cost performance ratio, featuring noise figure of 6dB and gain link of around 40dB. Click here to find out more. 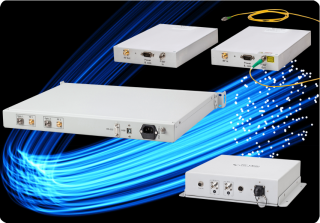 Our 26GHz for 5G cellular solution is a sub band of RFOptic’s RFoF 40Ghz product range. As with all our RFoF solutions, it features high SFDR and excellent flatness. It can be hosted as a standalone, indoor solution or outdoor solution. Our SNMP/HTML interface to monitor, manage and control our products up to 6 GHz remotely. This new ability is especially suitable for applications such as broadcast, GPS, remote antenna, satcom, or any application where a group of modules is installed. ECOC 2018. We will be there on 24 and 26 September in Hall 3, Stand 274+275 (Laser Optronic booth). EuMW 2018. We will be there on 27 September. To schedule a meeting at either event, please contact Mr. Oz Abramson at oz@rfoptic.com or visit our website www.rfoptic.com.